The 'democratic approach' to quality is emerging from the more traditional approaches as a distinctive attitude that is better suited to the modern health and welfare system. In 1905, Albert Einstein introduced the theory of special relativity, most commonly recognised as the famous equation E=mc2. His work shattered many scientific theories that were held to be true at the time and subsequently changed the shape of our world by its various applications. In the same way, Lattice Consulting proposes that the pursuit of quality by mental health and addiction services needs to change tack so that the people who both deliver and receive services are all involved in focused discussions about the notion of ‘quality’. What is it and how do we all know when we have achieved it? Communication – service users, families and the workforce interacting, talking and listening to one another and asking critical questions about the issues that really matter. Collaboration – people with shared responsibilities, working across professional, team, service, organisational and sector boundaries to achieve clearly identified, common goals for the benefit of the communities that they serve. Creativity – people are encouraged and rewarded to engage in reflective and innovative practice. Context – the complex interplay between different people and their environment is the messier and least well understood aspect of the performance story. In any discussion about organisational change and improving the quality of services the context is king. 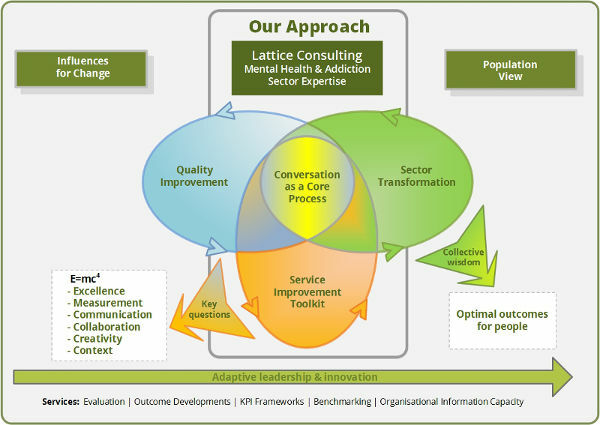 This diagram describes the Lattice Consulting vision of achieving optimal outcomes for people who come in contact with mental health and addictions services. We identify key areas, three of which link to focus on a core process - conversation.